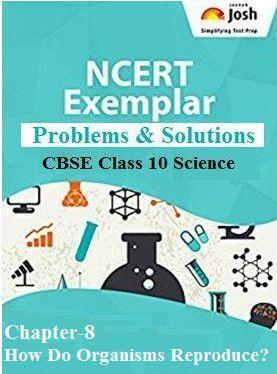 In this article you will get CBSE Class 10 Science chapter 8, Control How do Organisms Reproduce: NCERT Exemplar Problems and Solutions (Part-I). Every question has been provided with a detailed explanation. All the questions given in this article are very important to prepare for CBSE Class 10 Board Exam 2017-2018. Here you get the CBSE Class 10 Science chapter 8, How do Organisms Reproduce: NCERT Exemplar Problems and Solutions (Part-I). This part of the chapter includes solutions for Question No.1 to 27 from the NCERT Exemplar Problems for Class 10 Science Chapter: How do Organisms Reproduce. These questions include only the Multiple Choice Questions (MCQs) framed from various important topics of the chapter. Each question is provided with a detailed explanation. Explanation: Among the given options, Amoeba (binary fission), Yeast (budding) and banana (vegetative propagule) reproduce by asexual reproduction whereas dogs reproduce by sexual method. Explanation: Anther produce pollen through microsporogenesis and ovary produce egg cell by megasporogenesis. Question. 3 Which of the following is the correct sequence of events of sexual reproduction in a flower? Explanation: In pollination, pollen grains transfer from stamen to stigma after which fertilization takes place during which germ cells fuse together to form zygote which in turn leads to embryo formation. Fertilized ovule becomes seed and seeds germinate to produce Seedling. Explanation: Asexual reproduction does not involve gamete formation and fertilization. Explanation: Genes are the stretch of DNA and determine genetic characters. Explanation: Meiosis during gamete formation and fertilization produce variations while DNA replication ensures similarities. Explanation: All of them reproduce asexually. Explanation: Fragmentation is type of asexual reproduction in animals wherein parental body is broken down into pieces and each of these pieces develops into an individual animal. Explanation: Multiple fission is repeated division of organism to produce many daughter cells simultaneously. Explanation: Gamete formation is followed by pollination and fertilization to produce zygote which in turn leads to embryo formation. Fertilized ovule become seed and seeds germinate to produce Seedling. Explanation: Meiosis reduces the chromosome number to half which is then restored by fertilization. Explanation: Thin branched filaments of fungi are called as hyphae. Explanation: Flowers are the organs of sexual reproduction in plants. Explanation: Bread mold prefers damp and warm substratum with ample supply of nutrients on which its air-borne spores land and germinate to produce mycelium. Explanation: Pollen tube carries male gametes to ovule and hence, is long equal to the distance between stigma and ovary. Question. 16 Which of the following statements are true for flowers? Explanation: Flowers are the sexual reproductive organs of a plant and a fertilized flower give rise to fruit. Question. 17 Which among the following statements are true for unisexual flowers? (i) They possess both stamen and pistil. (ii) They possess either stamen or pistil. (iii) They exhibit cross pollination. (iv) Unisexual flowers possessing only stamens cannot produce fruits. Explanation: Unisexual flowers have either male or female reproductive organs and are cross pollinated ones. A fertilized flower gives rise to fruit. Question. 18 Which among the following statements are true for sexual reproduction in flowering plants? (i) It requires two types of gametes. (ii) Fertilization is a compulsory event. (iii) It always results in formation of zygote. (iv) Offspring formed are clones. Explanation: Sexual reproduction involves fertilization of male and female gamete to produce zygote having genetic variations. Explanation: Plumule 'A' give rise to shoots, cotyledon 'B' serves to store food and radicle 'C' grows into roots. Explanation: Sexual reproduction produces genetic variations by meiosis during gamete formation and fertilization of male and female gametes. Explanation: Reproduction serves to continue the species which would otherwise extinct due to struggle for survival and natural/accidental death of individuals. Explanation: Cracking of voice is one of the secondary sexual characters of human males. Explanation: Development of female secondary sexual characters marks onset of puberty and initiation of menstrual cycle reflects onset of reproductive phase. Explanation: Scrotum provides lower temperature needed for sperm formation. Question. 25 Which among the following is not the function of testes at puberty? Explanation: Development of placenta and secretion of estrogen are female reproductive functions. Explanation: Vas deferens delivers sperms from testes to urethra coming from the urinary bladder. Question. 27 Which among the following diseases is not sexually transmitted? Explanation: Hepatitis is water borne viral disease.